Got a call from a Bangor TV station today looking for a ten minute good-news interview about something positive happening in my town. (Full disclosure: This was not a random inquiry; I’m part of town government.) The station is going to be in the neighborhood tomorrow to film a segment on the sale of the old E.B. White farmhouse and wanted to know if I could add some news from Sedgwick. It’s not that nothing positive or newsworthy is happing here; I’m sure if put on the spot I could fill ten minutes without trouble. It’s just that TV is not part of my modus operandi. I’ve been living here since 2002 and have never watched a local newscast, and we don’t own a television. 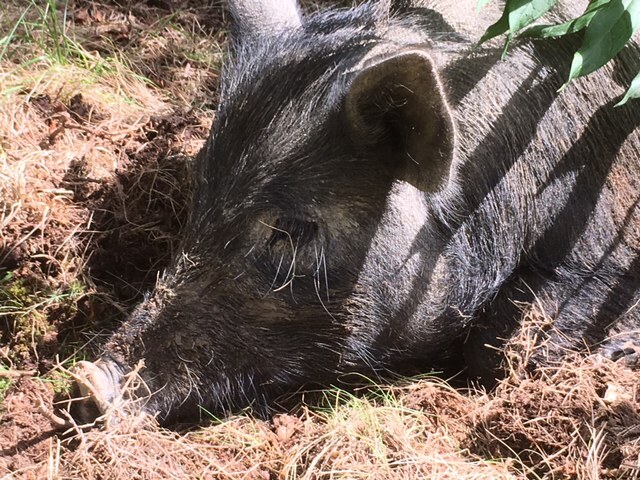 But, as I was out in the pig pasture this afternoon, I got to thinking about a perfect segue from a tour of the home of Charlotte’s Web. I got to thinking about granting an interview about having pigs and not wanting to eat them. “Where’s Papa going with that ax?” Where indeed? What follows from that first sentence from Charlotte’s Web is an adult explanation of the realities of life on the farm. Runts die swiftly by the ax or slowly from competition. The calculation is cold and monetary; it’s just not worth it to keep a farm animal that doesn’t pull its own weight. Farms work on the edge of profitability and can’t tolerate the small, weak and needy. Perhaps, I thought briefly, it would be in my pig’s interest to get their story out to the wider world of the Bangor television broadcasting area? This conversation in my head didn’t last long. That it even occurred to me to do such a thing is disconcerting.